Does the LED light on the Siren box flash at all times? Or can that be set via the App? I want to look like the alarm system has power. Comfort LED is available under the settings then general on the Yale App. You can set the light to flash however this can drain battery life so instead of 12/18 months life span you may have 8/12 months with the light on. Instead of having 2 zones being upstairs and downstairs could I set it up so I could have door/window contacts on one zone and pirs on the second zone, I want it so I can set the door and window contacts at night but I can still walk around the house if I get up for water or something I wont have to turn the system off until I want to leave the home. Yes you can do this. When creating the two zones you choose which devices are in each zone. You would simply select all of your PIR's in one zone and all the door contacts in the second zone. You can then control which zones are armed or disarmed via the app. Does the system have battery backup if there is a power cut? What happens to the alarm system if the wifi was to go down whilst it was armed? The hub has a rechargeable battery inside. In the event of a power cut the backup battery will kick in. Should your wifi go down, your alarm will still sound, but you won’t be notified until your wifi comes back up. Can multiple smart phones be connected to the system for control and monitoring? Multiple phones can operate the alarm, each phone will need to be linked/synced with the alarm using the Yale Smartphone app. Is there a time delay between accessing the property and the siren activating? For example; When I enter the house does the alarm hub beep for 10 seconds reminding me to find the key pad and to deactivate the alarm? Or does the siren sound as soon as I open the front door and trigger the PIR or Door switch? The Yale Smart Home Alarms have an exit and entry time delay. The standard time delay is 30 seconds but this can be adjusted to suite your requirements. How is the external siren powered? If batteries then what's the size and runtime? The external siren is powered by four alkaline D batteries which have a life of 18-24 months on average. My neighbour has a Yale alarm fitted, will it interfere if I install a Yale alarm? Each alarm runs on a different frequency, so one will not interfere with another. System sounds great but concerned about reading about systems being hacked (after resetting default passwords) and wireless jamming devices? The Yale Smart Alarms work on a very secure rolling code frequency of 868MHZ which offers a more stable connection and helps prevent anti jamming devices. When using the key fob can it arm and disarm zone 1 and zone 2 individually. The key fob will only operate the alarm as a whole. To alarm or disarm zones you must use the app. Can you trigger the alarm remotely via your smart phone? You can activate or deactivate the alarm remotely via the Yale App on a smartphone, but you cannot trigger the siren to sound. When arming and disarming the system does the smart hub produce an entry/exit sound? Yes when the alarm has been set or when entering the premises the system will omit a warning tone for 30 Seconds. How long does the siren sound for once activated? Once the alarm is triggered the siren will sound for 10 minutes. Can I use my existing Yale accessories with the smart hub? The Yale Easy Fit accessories will work with this alarm system. The older HSA models are not compatible. Referring to the Yale Smart Home Alarm system, how would the Smart hub notify of any alarm activations if the power had been cut? eg. Turned off at the consumer unit. It seems that system is wholly reliant on a wifi signal, to actually be smart. This alarm has a backup battery which would allow the alarm to function normally and send notifications if hub was unplugged. In the event of a full power cut to the property, your alarm would remain armed but you wouldn't receive the notifications without WiFi coverage. The ERA Invincible - Wireless SmartPhone Alarm includes a SIM card to send you a text notification which does not require WiFi. Can a photo be taken through the app at any time from the camera PIR or only when the alarm is triggered? The Yale App will allow you to request images at anytime and not only when the alarm is triggered. Are the key fob and panic button units included within the allowable 20 components? The Key Fob and Panic Button are included as part of the 20 components that can be linked to the alarm system. Is the motion sensor going to set the alarm off as a result of a light being turned on? I have timers set to switch the lights on and off. These sensors are not light sensitive. Only movement can trigger the sensor and set the alarm off. The sensors use infrared to seek any possible intruder. Can I activate certain door and window sensors while I'm at home? For instance, I would like to sit in the garden but want the alarm to go off if someone enters the house through the front door or windows. The system will let you to set 2 separate zones (eg upstairs and downstairs) allowing you to have one zone active and the other inactive. All sensors within a zone must be active/inactive, specific sensors cannot be chosen individually unless you make just one sensor one of your two available zones. I am interested in replacing my old wired system (which doesn't work), can the external siren be mains powered instead due to accessibility to change batteries? All components for the alarm systems are battery powered only. They do not have the facility to be wired into the mains electricity. Can insects or spiders trigger the PIR sensors? Due to it's size the insect would have to be virtually on the sensor. A fly in the middle of a room would not trigger the alarm, but a spider walking across the sensor lens would. If the alarm was activated from the app, would there still be arming beeps/noises at the keypad? For example, turning the alarm on late at night in bed from the app, would you still get noises downstairs that could wake family members? The arming tone is still omitted if this alarm is activated using the App. This feature can however be turned off in the settings menu or via the Yale app. What happens if you lose internet connection? What happens if one of the sensors battery dies? Can the system be hacked? Does the system come with a failsafe guaranty? If the internet connection fails the alarm will still be active but you will not receive the notification via your smartphone until connection is re-established. Should the battery power die in a sensor, this sensor will be in-active until the batteries are replaced. The alarms operate on a secure frequency that cannot be hacked. How do the door/window sensor contacts work with modern double glazing that don't close flush like traditional doors and windows, will they still operate correctly with my double glazing doors/windows that don't shut flush? The Door/Window sensors will only work if the two elements of the sensor are level. On your style of window this may mean some 'packing substance' is required on one part of the component to make it level. I do not require an external siren, could I use the Smart Home system with an internal siren only? All of the Yale Smart Home Alarms include and internal 94dB siren within the Smart Hub. The SR-310 does not include an external siren box as standard and would be the best option as only an internal siren will sound if the alarm is triggered. Will the app notify you when the batteries are running low in the siren, motion detectors or door sensors? The app will notify you if any batteries are running low on all the components. You can monitor the battery life for each component via the smartphone app. Is the alarm a grade 2 system? The Yale Smart Alarm series are classed as DIY alarms and are not graded. Will this phone alarm system work with my Microsoft 10 platform moblie phone [lumina 640]. The smart alarms are only compatible with SmartPhones that operate on iOS 9.0 and above or Android 4.2 and above operating systems. I have quite a large ground floor of my home and would need to ensure that the PIRs are not out of range. What's the maximum distance a PIR can be from the hub? The PIRs have a 30 meter maximum wireless connection range from the main hub. Can I buy a system without cameras and add cameras at a later date? Yes the Yale Easy Fit PIR Image Camera can be easily paired to the alarm system if purchased at a later date. Will the smart home alarm still work if your wifi goes down? In that time if someone breaks in, will the alarm still go off? In the event your wifi goes down and an intruder triggers the alarm, the alarm will still sound inside and outside from the bell box. You just won't get a notification on your smartphone until wifi is back up and running. Will I still get a text message on my phone when I'm abroad? You will receive a notification anywhere in the world if the alarm system is triggered, providing there is an internet connection via data usage or WiFi connection. Can you have two keypads with this alarm? You can add up to 20 devices to your Yale Smart Home Alarm, including additional Keypads. Can you connect two external alarm boxes, instead of one active and one dummy? All the alarm systems are provided with one Active Siren Box only. These are not available to order as an additional accessory. If you are aboard on holiday and the alarm goes off how many people can have the app on their phone? There is no limit for the amount of people who can be registered to operate your alarm via the smartphone app. New users need to download the app to their phone, enter the smart hub serial number and enter the password which you have chosen during the initial setup. What is the maximum range between a PIR/Door Contact and the hub? The range is up to 30 meters but this is dependent on the number of walls between the hub and contacts. It says the PIR's should be mounted at 1.9 to 2m high how critical is this? If I mount them at ceiling height in the corners at about 2.4m high, what difference will it make on their operation? The Yale Easy Fit PIR has a maximum height of 2.5 metres so this would be suitable for the desired location. However the Yale Easy Fit Pet PIR operates on a slightly different sensor and has a height restriction of 2 metres. When you set the alarm to home mode (at night for example) is there any beeping or sound from the main unit? I Don't want lots of noises and waking the family when it's set. The alarm will bleep for a few seconds while you engage the home function. However once this has been completed the alarm would be completely silent until deactivated. Can I add more PIR motion detectors, video catcher and door sensor? Are they available to be purchased additionally? Additional alarm accessories can be purchased at the point of order from the accessories list and can be ordered and paired with your alarm system at a later date if you decide to add additional sensors in future. This alarm system can include up to 20 different components. Can I install two control panels on the system, one upstairs and one downstairs? If a PIR is activated is there a 20 sec lag before the alarm goes off? Yes, all you need to do is add an extra Yale Easy Fit Keypad to the one included in the box. The keypads are portable or wall mount and can be used anywhere within range of the Smart Hub. If a PIR Sensor detects motion it activates the alarm instantaneously. What sort of batteries do the door sensors, PIR detectors and cameras take, and how often do they need replacing? The door sensors use V3 Lithium batteries. The PIR motion detectors and cameras take AA batteries. Both devices include batteries and they should be replaced every 18 months on average. I want to have a PIR Video Camera in my hallway pointing at my front door, which will be my main point of entry, to record anyone entering this way. Will this be possible or would I trigger the alarm every time I opened the front door to access the keypad? An entry and exit time can be set allowing you to enter or exit the premises without triggering the alarm. Once this period expires any detected movement would trigger the alarm. Using the Yale Smart App would also allow you to deactivate the alarm before entering. How is the battery life? How often do you have to change it? The battery life on the accessories should last for at least 18 months. I saw that batteries in the various components lasts around 24 months - is there a notification e.g. beep from the PIRs when the batteries are running out? The Smart Hub will beep to indicate you that you have a low battery. The information is also provided in the device menu. Is the Smart Hub the same for all smart alarms? Can I buy the starter Smart kit and add on all the components that come with the top of the range Smart alarm? The Smart Hub is the same for the full range Yale Smart Home Alarms. You can add any additional components to work with your system at any point. Can the Smart Alarm Hub be wall mounted? The Smart Hub can be free standing or wall mounted and includes a mounting plate with two holes for fixing to the wall. How many phones can be set up to receive the message? Also is it tamperproof? There is no specific limit to the number of phones which can be registered via the ‘Yale Home System’ app. Also, there are tamper mechanisms for all of the components of these alarms. Can zones be selected with this system. For example at night downstairs armed but upstairs not. Yes, the Yale Smart Alarm series can be programmed to create two different zones allowing you to arm one or both zones. With the smart home alarms is there a monthly fee? One of the best features with the Yale Smart Home series is that there is no monthly fee or hidden cost. How are the door/ window sensors fitted - is there any screwing into windows/ doors required which could invalidate guarantees on composite doors? The Door Contact fixing kit comes with four 13mm screws which would secure the unit in place. Is it possible to receive an alert that a door has been opened but without the alarm siren going off? This alarm kit includes a 'chime' feature option where the hub will beep when the door is opened. It says the alarm can have 20 accessories in total. The pack comes with a total of 6 items. Is the hub included in the 20, or is it 20 accessories can be linked to the hub? The hub is will accept up to 20 components. Can you set zones, so for example if I only wanted to set downstairs alarm? You can set two zones. Downstairs can be set as one and upstairs as the second. Is it possible to check the status of the door sensors from the app? For example, if a door is open/closed? It is not possible to check the status of individual components. However, if the door was opened, the alarm would notify you via push notification. How many key fobs can I have? This alarm will accept up to 20 different components, including key fobs. Is this security system compatible with Apple's 'HomeKit'? This is system is currently not compatible with the Apple HomeKit. There is no way for the systems to link or communicate between each other at the moment. Can the system be bought with the pir video camera instead of the pir still image camera? Also, do Yale have a dual technology motion sensor for this system? Accessories for each alarm kit cannot be swapped because the boxes are security sealed. You may prefer to order the Yale Smart Home Alarm Kit - SR-320 and add the Yale Easy Fit PIR Video Camera as an accessory when you add the alarm to the basket. Yale do not currently supply dual technology motion sensors. Is there a way of connecting my Yale keyfree to unlock from the app too? With a Yale Smart Lock Connected Module added to the Smart Lock, you could control the lock and alarm with one App. Is the notification to mobile compatible with Android phones. The alarm system will send notification to Apple or Android Smartphones and can be fully controlled by either via the Yale App. How long do the batteries in the various parts last? Is the main outside box mains wired? The Smart Hub is mains powered but all other components, including the external siren, are wireless and are battery powered. The battery life on the components is approximately 24 months on average. I am guessing the exit entry time delay has an audible bleep. If so can this be put on silent mode so the whole household is not woken when disarming in the morning. Yes, you can mute this sound via the Yale App settings menu. What's the difference between this smart range and the HSA app enabled kit? Both seem to be accessible systems by phone. The Yale Smart range is the updated and improved version of the HSA range and works on a more secure frequency of 868MHz. Can I control 2 alarm systems from the smartphone app? I have a large detached garage where I would like to install an additional alarm system. The buildings are around 4m apart. Will the alarms interfere with each other? Unfortunately you can only use 1 x APP per Alarm system.The Alarms work on a very secure frequency meaning that they would not interfere with each other. However if you have got a large space to cover why not take a look at our ERA Invincible - Wireless SmartPhone Alarm this model has an 80 metre open wireless range. Do you do pet friendly kits? Our range of ERA Burglar Alarms include pet friendly PIR's as standard. Alternatively, you can purchase Yale Easy Fit Pet PIR Motion Detector's and add them to any Yale alarm kit. Does this have anti-jamming technology? 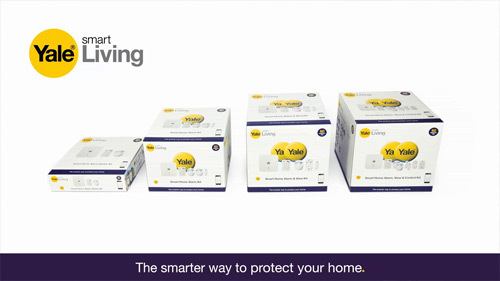 All Yale Smart Home Alarms incorporate enhanced anti-jamming technology. I do not want to activate alarm accidentally, can I set the keypad to ask pin on activation? Unfortunately the Yale Smart range does not have this feature. Providing the alarm has a stable internet connection the full functionality should be available and the alarm will operate as normal. With the Yale Smart Living SR-330 does it have to be connected to the WiFi to work or can it be used without a connection and still go off when armed if triggered? Without an internet connection, this alarm will work as a standard alarm system. Triggering the alarm will activate the siren but you wouldn't receive notifications via the app. I currently have a Yale wireless alarm system installed in my home. The system is about 5 years old and have two questions. Will all the PIR's, door contacts and external siren work with a new Smart Home alarm? Can I have two external sirens (front and back of house) paired to the controller at the same time? Unfortunately the new Yale Smart Alarm range and components work on a different and more secure frequency than the older Yale Alarms so they would not be compatible with the model you have. Also only one siren at a time can be paired with the central hub. Can I use this system to alarm my garage door? This should be possible providing the sensor is within the 30 meter wireless range of the central hub. What is 'angle of view' of PIR image camera? The viewing angle is 110 degrees horizontal. Are the PIR and video cameras suitable for external mounting, or are they only for use indoors? The cameras in the alarm kits are only suitable for use indoors. However, we have Yale CCTV systems for external use which can be linked. Would the standard PIR set the alarm off with a cat moving? The Yale Alarm bundles only include standard PIR's. I can however recommend the ERA HomeGuard Smart Alarm Pro - Junior Kit with a Pet PIR included. Pet Motion Sensors would be essential if you have any small to medium pets. What happens if there is a power cut or someone was to turn the power off to the circuit with the hub on? Would the system still record images/video and then send on reconnecting? My consumer unit is in the garage so could be used to isolate the system and this is a concern before purchase. The Yale Smart Home Alarm Series has a built in rechargeable battery located in the hub and all contacts work with standard batteries so in the event of a power cut your alarm and its key features would be fully operational. What's the resolution of the PIR camera. Realistically what is the quality of the images taken? And do they work at night? The camera provides a high quality 320 by 420 pixel image with a 15 meter range, including night vision. Could I buy a second keypad so I can have one upstairs and one downstairs for the same alarm system? Yes a second keypad can be selected as an optional extra from the accessories section at the point of order. Can you purchase an external camera for this system? There is no external camera available for this system. You could however, link the alarm system to one of the CCTV Kits we offer using the Yale CCTV Alarm Link USB Adaptor. On a Yale smart alarm can I disable the internal siren for testing purposes? You can change the sound to low in the settings menu but you can't disable the siren. Do the standard sensors work in cold temperatures? For example if I was to put one in my garage, which gets quite cold in the winter, would the sensor still work ok, or do I need to purchase a specific sensor for these conditions? The sensors are primarily designed for internal home use. You could however fit a sensor in your garage providing it is with in range of the main hub. Temperature fluctuation should not effect the sensors, but this would be dependent on the severity of the temperature change, for example cold temperatures can sometimes effect battery life. Can the keypad be hardwired for power instead of using battery power? The keypad is only battery operated and not mains powered. Will this connect to a Yale Smart Living locks? This alarm can be connected with the Yale Smart Lock range providing the Yale Smart Lock Connected Module is fitted in the lock. Can I add a second keypad to the system so I can have one at each entrance? Yes, you can add up to 20 components to the system, including additional Yale Easy Fit Keypads. Are the Yale intruder systems home insurance approved? No, as the Yale smart/telecommunication alarm kits are classed as DIY alarms. Can the door contacts be used on patio doors? Yes, they can be used on most patio doors (this does depend on the door itself) please make sure that once the Door Contact is fitted there is no more than a 10mm gap between the contact and sensor. Is the Smart Hub counted as one of the 20 components? No, the Smart Hub is not counted as one of the 20 components. What happens if I need to turn the power off and restart the alarm. You can turn off the power when needed. The alarm will not trigger and no memory is lost. Can I fit this alarm myself? The Yale Smart Home Alarms are classified as DIY alarms as there are no wires. All the accessories are wireless. You can install the alarm yourself but we do offer an installation service if needed. I have cats, is this system suitable? The standard PIR motion detectors will detect any movement, including small pets. You can purchase additional Yale Easy Fit Pet PIR Motion Detector's for this kit or you may wish to consider an ERA Wireless Alarm which include pet friendly PIR's as standard. Does anyone know the actual size of the hub please? The hub is 114.3 x 114.3 x 25mm (HxWxD). Pictures sent from the Yale Easy Fit PIR Camera are reliant on a WiFi connection. Without an internet connection, the alarm siren would still sound but you would not receive any form of notification via the Smartphone app. Is there any reason this wouldn`t work in my villa in Spain? It has fibre broadband. If there is a power and internet connection this should work. Please note this product has UK based warranty. If an intruder triggers a PIR sensor do they have 30 secs before the alarm goes off and If they smash the PIR sensor within that time delay does it stop the alarm sounding? It is possible to set a delay to allow you to enter the property and disarm the alarm without triggering the siren. If the alarm system is not disarmed during the entry period, then the alarm siren will sound and you will receive notifications to your smartphone. It is not possible to disarm the alarm by breaking the sensors. Are the batteries being used constantly when the alarm is activated, or are they on standby until it is triggered? The batteries inside each component will remain on stand by until they are triggered. We estimate that the battery life is around 18-24 months on average. I'm looking to have additional accessories. Can the sensors be used in my garage? It is possible to add additional accessories but all accessories must be within 30 meters of the smart hub. Can this be run as a completely silent alarm, i.e. when there is an intruder, customer and police are notified but no audible alarm is triggered in the building? I believe this provides a better chance of catching the intruder than audible alarms which neighbours/passers-by generally do nothing about, and just encourage the intruder to hurry up and/or destroy the alarm if possible. This alarm could be silent, if you do not use the external siren when operating the alarm. Providing the hub is connected to the internet router you would still receive an alarm activation notification to your mobile. I have a Yale alarm on my home but I would like to install a second Yale alarm on a different property but control this from the same phone - is this possible? Or can you only control one alarm system per phone? Unfortunately you can only have one App downloaded to any phone at one time and each App works independently with each individual hub. Does the door sensor have to be screwed into the door or is it able to be stuck on somehow? My door is under warranty and I'm not allowed to screw anything into it or make any holes in the door as that would VOID the warranty of my door. The sensors are supplied with screws and adhesive pads, so that you can choose the most suitable installation method for your needs. Does the SR-320 work on 2.4ghz, 5ghz WiFi signal or both? The smart hub connects to your router via an Ethernet cable and is not Wi-Fi compatible. Each wireless component works on a frequency of 868MHz. If the alarm is triggered and siren sounds for 10 minutes and then stops, does the alarm then reset itself or does it remain off? The Alarm would remain armed and siren again if another PIR or door contact is triggered. Can you link more than one smart hub together to extend range e.g. to a garage or are there range extenders for this system? Unfortunately only one hub can be activated at any one time. I can recommend the ERA HomeGuard Smart Alarm Pro - Junior Kit, which has an 80 metre open field range. When system is armed will the smoke detector alarm notifications be sent to my smartphone. The Smoke Alarm would send the same push notification as any of the other accessories to your smart phone. Will a cat opening an internal door activate a pet friendly sensor? The Pet Friendly PIR would not be triggered by the cat, however it would be triggered by the opening of the door. Is it possible to connect the ethernet cable to a powerline adaptor rather than directly to the router? The Ethernet cable would have to be plugged directly into the router. Is this system compatible with Alexa? Unfortunately this system is not compatible with Alexa. Can this alarm be setup to make 3 zones or any additional items be purchased to do this? I want to arm my house as suggested (Downstairs and as a whole depending on if I am in) but also my garage separately to the house. Can this be done? The alarm system will only allow 2 zones to be set, all sensors with in a zone must be either active or in-active. Can you please tell me whether the Yale smart alarms offer the same level or equivalent level of security as the Yale intruder series? They mention professional grade security whereas the smart ones just say anti jamming? Does this make the intruder series more secure in reality? As both units work on a very secure 868MHz frequency, both would be as secure as each other and they incorporate anti-jamming technology. In the event the alarm is triggered do you get a phone notification or an email? You can choose how you wish to be alerted. Options include e-mail alerts as well as push notifications via your smart phone. Do Yale make a pet-friendly easy fit camera? Unfortunately, as of yet, it is only the PIR sensors that have the pet friendly functionality. I want to turn on the alarm from the panel next to the exit door (which has a sensor). Is it correct that if the door is open and I press the arm button on the panel the system will not arm (since the door is open to allow me to get out)? How can I arm the system in this scenario? only with the app? As Standard the alarm would not arm, however you can 'Force Arm' the alarm by pressing the arm button a second consecutive time. You can also do this via the app but you would receive a warning notification to advise that the door was open. If I have more than one alarm, example- two different properties with the same alarm, can I still use one smart phone app? The Yale Smartphone app only allows for one alarm to operated at any one time. It is possible to create 2 accounts but you would be required to log in/log out every time you want to switch from one system to the other. Do I need a landline for this alarm? I just have a smart phone. This smart alarm has no connectivity to a landline telephone. All communication is via the smart phone app. A PIR or Door Contact would be fine in a bathroom as long as there is suitable ventilation. Are additional window/door contact magnets available? Unfortunately spare parts are not available, you would have to purchase the full unit. Is the Yale Smart Home Alarm compatible with other home smart technology (Smartthings, Nest, LightwaveRF, IFTTT, etc)? If not are there plans to integrate? The Yale alarm systems are only compatible with other Yale Smart products. As yet they cannot be used in conjunction with other domestic Smart systems. I live in a old cottage that has internal and external solid stone walls that are 460mm thick. Will my external siren and PIR cameras etc still work with this type of wireless system or do I need a wired system for my house? The normal wireless range is 30 meters but this would be reduced slightly due to the thickness of the walls in your home. Will the alarm system trigger with cats moving around the house? Any motion in the house will trigger this unit. I would recommend the Yale Easy Fit Pet PIR Motion Detector in addition if you have any pets in the house. Does the system record video/stills in the event of the alarm triggering so that they can possibly be used for evidence at a later date? If yes, then how long does it record for and how long are the recordings kept for? The camera can capture an image or record a 10 second video. The images or video can then be viewed on your SmartPhone using the Yale Smart Home Alarm App and stored on the device the app is used on. Does this alarm beep when you set it so that you know that it's armed and have time to leave the house? Yes the system allows an exit and entry time to be set and will omit a tone during this period. Is this alarm NACOSS approved? Unfortunately this unit is not NACOSS approved. Is this alarm compatible with a Windows 10 phone? This alarm is currently only compatible with iOS and Android devices. Is there a Yale app for Windows phones? The Yale smart alarms are compatible with IOS and Android smart phones only. You could consider the ERA Invincible - Wireless SmartPhone Alarm which allows you to fit a Sim card with in the hub to send you alarm notifications to your mobile. Can I use an additional Keypad for say the back door and use the same alarm code? You can buy an additional Yale Easy Fit Keypad. Each keypad is programmed with a code of your choice which can be the same code for each if you like. Will this product work with the Yale Easy Fit 960H 2 Camera CCTV Kit? Also, will it work with the Yale EF-USB DVR CCTV? Does it need the alarm Link Adaptor to link the two systems together? Yes you can link the alarm and CCTV kits together but they will need the Yale CCTV Alarm Link USB Adaptor to do so. Will my 5kg pet trigger this alarm, are the PIR sensors pet friendly that way? With the standard PIR sensors once movement is detected when the alarm is armed it will trigger the siren. You will need the Yale Easy Fit Pet PIR Motion Detector (3 pack) as these will only activate the alarm when larger movement is detected, pets below 20-25kg will not trigger the alarm making the sensors ideal for homes with small pets. Can the system be operated without a phone? Although the main control method with Yale Smart Home Alarms is with a smartphone via the Yale app, you can arm and disarm this by using the portable keypad which is included. If the camera detected movement, would it set off the siren or just send a notification to the smartphone app? When the image camera is triggered it will alarm the siren and also send you an image through the Yale App. Does this work with Android smartphones? This system is compatible with Smartphones with Android 4.2 or above operating systems. Which is the newer system, Easy Fit Kit 3 or the SR-330? Which is best? The SR-330 alarm kit is the most recent model and includes Yale's new Smart Living branding and an upgraded Wi-Fi control box. The alarm is controlled by your SmartPhone with exactly the same features and accessories as the Yale Easy Fit SmartPhone Alarm which is being phased out. Can you add a second Image PIR sensor to have 2 sources of images from different rooms? You can have up to 6 PIR Image Cameras added to the system, these can be selected from the accessories list at the point of order. We use our back door as main entry and exit can I fit door contact and a pir camera in this room or just the pir camera? Both sensors could be fitted within the room, though depending on access/coverage either sensor alone would be sufficient. Can you run system through a NVR to record images so you can view recorded data online? Unfortunately there is no constant record function or facility to connect the Yale Alarm Series to an NVR box. Once photos have been taken, they will be sent directly to your smartphone. If the Yale Smart Home Alarm is triggered does it notify you via a phone call (like the older Yale alarms)? When the alarm is triggered you will receive an email and text alert notifying you of alarm activation. If you require a telephone call when the alarm is triggered you would need the Yale Easy Fit Telecommunicating Alarm. Is there an RFID tag that can be used to arm / disarm the system from the remote keypad? Unfortunately this system does not have an RFID Tag facility. I can recommend the ERA HomeGuard Smart Alarm Pro - Superior Kit which does include RFID tags as standard. Can an external siren be added to the Yale SR-310 Smart Home Alarm at a later date? Unfortunately, we do not sell the external siren boxes separately. You would need to look at the Yale SR-320 Wireless Smart Alarm Kit. Can you add wireless outdoor cameras to this kit? If you can do you know if these cameras are disabled when you disable to main alarm? Unfortunately external cameras are not available for this product. You may be interested in the ABUS Smartvest - Wireless SmartPhone Alarm Kit 1 and the ABUS TVAC 19100 WLAN Outdoor IP Camera which work together. What would happen if an intruder turned off the router in my house? Would the camera still take photos, and would I still receive these photos to the App? Without WiFi connection you will not receive pictures or notifications via the Yale App but the alarm siren would still sound when the alarm is triggered. Does the system have a setting for an audible alert if one of the doors is opened even if the alarm is not set. Our old system used to sound a bleep when a door opened, useful to make sure that the grandchildren don't escape. This system will only give notification of alarm activations when the alarm armed and it is connected to the internet. Is the Easy Fit PIR Video Camera pet friendly? The Yale Easy Fit PIR Video Camera is not pet friendly and will trigger the alarm upon detection of any movement. Is there a keyfob which can be used with the yale SR -330 Smart home alarm? The Yale Easy Fit Keyfob is compatible with this alarm system. Does the door sensor contact chime when its been triggered? The sensor itself does not omit any sound. It will just trigger the alarm siren once door contact has been broken. Can you add keyfobs to fully arm and disarm certain zones? The Keyfob accessory can be added to your system and it can arm and disarm the alarm. The alarm will allow you to have 2 separate zones and these could be fully armed or dis-armed by the Keyfob if the zonal setting has been used. If the alarm was set off, can I turn it off by phone if I'm away from the house ? Yes, providing you have an internet or data connection such as 3G, 4G or Wi-Fi you can control the alarm with your smartphone. Is an annual maintenance contract available? One major advantage with the Yale Smart Home Alarms is there is no need for an annual maintenance contract. The only thing that needs maintaining is changing the batteries when power is low. Keep track of the battery life for each component via the app. Can this Yale security system be used to place the camera outdoors to detect movement? The alarm system is designed for internal use only, the sensors have not been tested for performance outside where they are exposed to the elements. We do offer a range of CCTV Kits which are suitable for outdoor use should you wish to consider these. Is there a wireless external camera/video which can be viewed in the app. Unfortunately Yale do not manufacture external cameras for the Yale Smart Home Alarm systems. However if you are looking for external security I can recommend our Smart HD CCTV Kits. If my wifi goes down, I understand that I won't receive a notification via the app, but will I still receive an sms? This alarm system does not issue an SMS message for notification. The 'Text' alert that is referred to is a message sent via the Yale App. Without an internet connection you will not receive this. You may be interested in the ERA Invincible - Wireless SmartPhone Alarm which sends SMS text message alerts when the alarm is triggered. Does it work with an iPad? The App is designed for an iPhone screen but is downloadable via an iPad providing the software is iOS 9.0 or above. Can I add third party sensors to the Yale Smart Home Alarm systems, for example a microwave sensor? Unfortunately the Yale Smart Home Alarms are not compatible with 3rd party microwave presence sensors. I read that the system only warns you of a break in with an email, not a push notification. Is this true? Do you have any plans to add this function? All the Yale SR-Smart Alarm Kits can either have push notification or email alert. You can customise settings in the Yale smartphone app. I want to install the alarm in a new house that won't have wifi yet but will be adding wifi at a later date. Is it easy enough to pair the alarm with the newly installed wifi system when it has been installed? The alarm system comes with an Ethernet cable for you to connect the central hub to your broadband router. Once connected the hub will use Wifi to connect to each device synced to the system.